You are here: Ronni wins residents award! The Get Involved team had the pleasure of presenting the resident award to the very deserving Ronni. 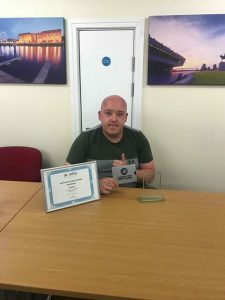 He was joined by fellow residents and staff in celebrating his award who were all very proud of his achievements. Ronni was nominated for his selfless work in and out of the hostel. Ronni is also the resident representative at the service and takes his role very seriously by supporting other residents both practically but also with signposting to services and activities.